Surf Side Cottage! 60 STEPS TO THE SAND! This is a great value and very close to the beach, just in from the boardwalk. You will love our Sand Castle which is located just off the Boardwalk, fifty steps to the sand! Three doors from the shore near the corner of Ocean Front Walk and Dover Court. Bright and sunny cottage style unit with big patio area and covered parking. We have two of these cottages sitting side by side. See photos that show two of each room and click on map to see how close we are to the surf! Our Sandcastle is located at 722 and 724 Dover Court in South Mission just south of the Roller Coaster. Ground level, Single-level, and also has a great outdoor patio with table for four to six. Enjoy grilling and dining while just steps away from the deep blue sea, the boardwalk, sandy beach, and surf! Close to the action, yet quiet and a few doors away for a more peaceful stay. Your kids can play in the ocean right in front of lifeguard tower #12 which is located right out on the beach where you will set up your day at the beach! Extra guests will enjoy the quality Sofa/Futon in living room, always a favorite place to sleep with the TV, DVD and VCR remotes in hand. Lots of windows give this Beach House character and a Beach Cottage feel. Plenty of bike parking too. Breakfast Bar connects living and kitchen area. Great Location in Mellow South Mission! Not too close to the crowds, but close enough to be convenient and easy. Bike rentals, kayak rentals, sail boats rentals are all nearby. Amusement Park, Market and restaurants all within 2 to 3 block walk..
Carport parking is covered and semi-enclosed. The washer and dryer will help you pack lightly. We have a clean laundry room just steps from your back door. Planning a Family Reunion or Group Trip? Rent one or all of our Sandcastles! We offer two neighboring buildings with a total of five units to choose from ranging from one to three bedrooms. We can sleep 2 to 28 guests!!! We also have a three bedroom unit available at VRBO #134781, #217948 and a two bedroom unit available at VRBO #53900 YEARROUND , if you need another unit for a reunion. All of our units sit side by side and total six bedrooms, so bring the entire gang and hang out as neighbors! Check out all of the extra photos! Compare with others! This is the best value in Mission Beach! We would love to have you visit us! Owners or Crew are on site to greet you upon arrival to insure you have the best Summer vacation ever! We want you to come back again and again... and you will! Family of 5 loving the Beach! Great beach with lots of room to run and play! Close to the fun Roller Coaster and Carousel and shops too! Bike riding on the boardwalk is the best! Flat and easy access directly onto the beach, just three doors down from our cottages. Easy to load up all the gear and hit the beach! Our Mission Beach VRBO was perfect! 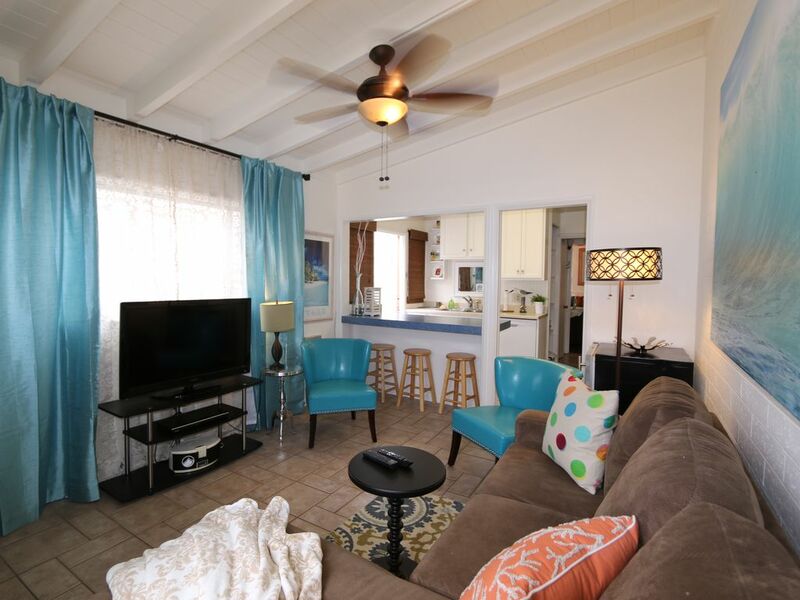 Just a stone's throw from the beach, close to many amenities--we loved it! We have no complaints. Everything was exactly as promised. We plan on coming again! We had a great time, the location was good, close to boardwalk but just far enough away from all the action. Easy to get to and out of. Will be back again! Thank you! Living room is not as pictured. Sofa is very uncomfortable futon. No hairdryer. Bathroom is way too small. Disgusting mat in shower. Grill outside is beyond use without contamination. Very nice place to stay. Very clean, great location. Has everything you need. We would stay there again. The cottage was exactly as described. It was so close to the ocean/beach (can't see it, but a very short walk). It was clean and had everything we needed for our stay. (Only problem we had, was our time staying was to short and the weather was on the cool side). I would definitely recommend this cottage to our family and friends to stay at. Amazing location! Great people to deal with! Location was great, managers were great to work with. Would definitely stay again! Thank you!